Ƿorulddǣlas sind þā mǣstan land on þǣre ƿorulde. Be sōðe tǣcneþ ƿorulddǣl ǣnig dǣl þǣre ƿorulde, ac þæt ƿord is gebrocen hēr tō hātenna þā seofon (rihtor seoxe) mǣstra landa on þǣre ƿorulde. Hī sind Asia, Affrica, Norðerne Ƿīnland, Sūðerne Ƿīnland, se Andnorða, Europe, and Sūþland. Europe is sōþlīce arm Asie, and for þǣm mæg man hī ætgædere "Eurasia" hātaþ. Tō bēacnienne þæt man ƿille be ānum þisra landa sprecan, mæg man "hēafodlic" tō geīhtnesse brūcan, tō bisene: Hēafodlic ƿorulddǣl. In gēardagum segede man þe þēos ƿoruld ƿæs in þrim dǣlum bedǣled - þæt is Europe, Asia and Affrica. Þis ƿæs ǣr ƿesterne menn afundon American and Australie and Antarctican. 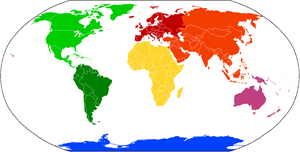 Color-coded map showing the various continents. Similar shades exhibit areas that may be consolidated or subdivided. ↑ 3.0 3.1 "Continent". Encyclopædia Britannica. 2006. Chicago: Encyclopædia Britannica, Inc.
↑ 7.0 7.1 7.2 "Continent". The Columbia Encyclopedia. 2001. New York: Columbia University Press - Bartleby. Man nīwanost wende þisne tramet on þǣre 01:37 tīde þæs 4 Wēodmōnaþ 2018.